I was surprised to find out just now that I had earned the Civic Duty badge. The badge requirement is to vote 300 times. However, when looking at my profile, I see that the Votes Cast votes tab shows only 267 votes. Perhaps I voted on questions that were later deleted, which removed the vote from my Votes Cast page but still counted toward the badge. Any thoughts on why I earned the badge but can only see 267 votes that I cast? 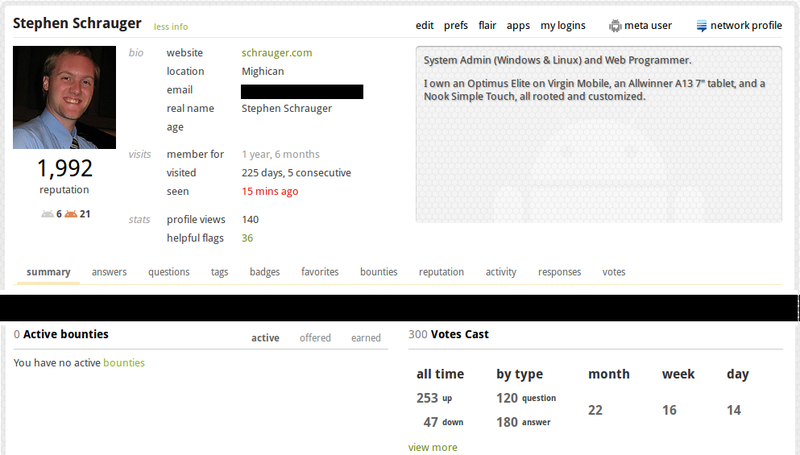 Edit: On my Summary page, it shows I have voted 300 times (which I see before). However, my Votes Cast page has a different tally. See the screenshots attached. It looks like the votes tab only shows details for votes to questions and answers still in existance. That is, deleted questions/answers are removed from the votes tab and also change the tally on that page. However, the Stack Exchange database still keeps track of your votes on deleted items and counts that toward the total votes needed for a badge. It also shows this accurate total on the summary profile page. I think that the votes page should show a correct total, perhaps distinguishing between available and deleted votes. Not the answer you're looking for? Browse other questions tagged bug feature-request voting profile-page .